Is Chronicles of Riddick more of the same or will this sequel outshine its predecessor? After 5 years in isolation, Riddick finds himself on the planet of Helion Prime and up against the Necromonger army. Here he must find an old friend and try to save the humans from the Necromonger empire. 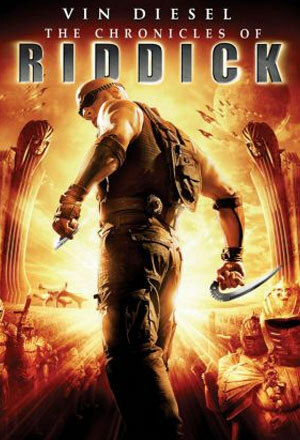 Similar to the first film, Riddick spends a fair amount of time in captivity, only for him to break out multiple times again which heightens his status in a Rambo-esque fashion that comes with prison escape. The Chronicles of Riddick sees him portrayed almost as a superhero, with his supernatural fighting skills, quick reflexes and super-human strength always being used at points of combat. However, it cleverly avoids any official superhero persona, allowing Riddick to develop purely as a human. A new addition to the franchise is the brief scenes of narration, which prove an interesting inclusion to a fairly simple storyline. These heighten Riddick’s hard man appearance with him confidently thinking how he’ll get out of captivity and dangerous scenarios. This is not a necessary inclusion but is effective at adding more depth and interest to the plot. The increase of deaths and explosions attempt to define the film more clearly in the action genre. However, spaceship battles, scenes in space and the new Necromonger race importantly set it apart from the usual gun-blazing, high adrenaline Vin Diesel flick. Thanks to this, the Riddick franchise still maintains it’s Sci-Fi routes, creating an increasingly enjoyable film series.